We all know and love our pocket-sized Moleskines, whether it be ruled, squared or plain. 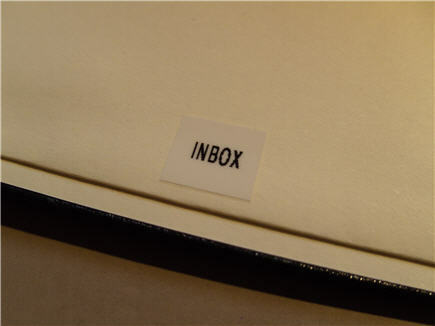 It is -of course- possible to hack pocket (or large) Moleskine notebooks for use with GTD. See, for instance, this article on lifehack.org. The drawback -to me at least- of these existing notebook GTD hacks is that you end up with lots of labels and tags sticking out of your elegant Moleskine, which I find rather awkward. I’ve found a rather obvious solution which is pretty elegant nonetheless. 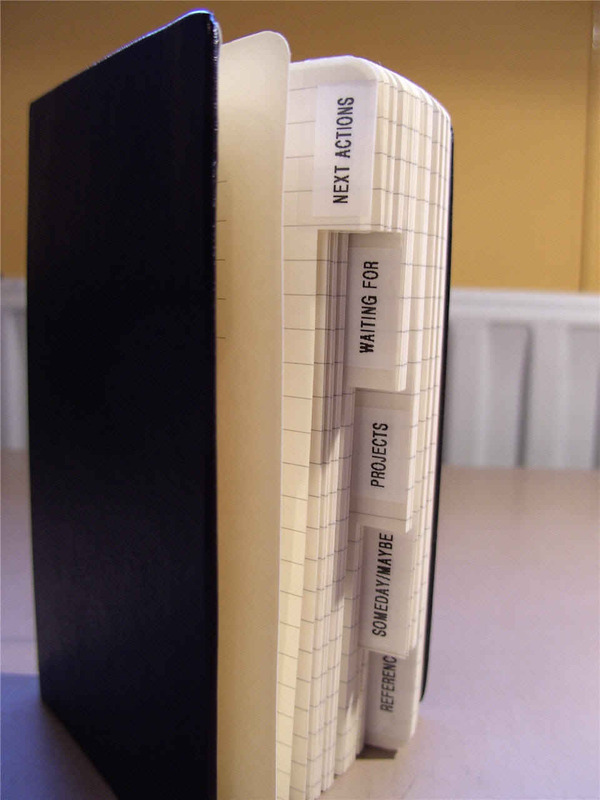 Using nothing more than a standard pocket Moleskine infobook and a label writer, I have created the perfect GTD tool. I started with a standard pocket Moleskine infobook which has 6 sections labeled: bed, food, people, sights and facilities. It also has an expandable inner pocket in the back. This highly compact and elegant GTD tool is now ready to assist you in getting things done! So is the info book just for capturing ideas on the fly? Then you translate them into next actions and put them on the appropriate list? Actually, it is supposed to be a full-blown mobile GTD system. The six relabeled sections of the Moleskine infobook and the expandable inner pocket supply everything I need to keep GTD going. However, I haven’t made my mind up about which system is best suited for me. Right now I am using Excel in combination with PocketMods. 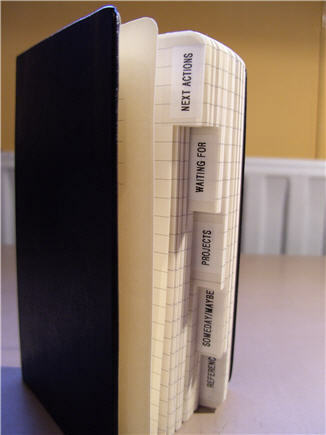 I’m very tempted though to start using this GTD hacked Moleskine in combination with my pocket Moleskine diary 2007! Thank you for sharing your GTD experiences! I’d already posted your blog on my delicious. This is a neat hack for the travel info book, I like it a lot. I’d seen these books a few times in the past but always dismissed them because I really wasn’t traveling. This is a great way to re-purpose it! [quote comment="14"]This is a neat hack for the travel info book, I like it a lot. I’d seen these books a few times in the past but always dismissed them because I really wasn’t traveling. You’re right! 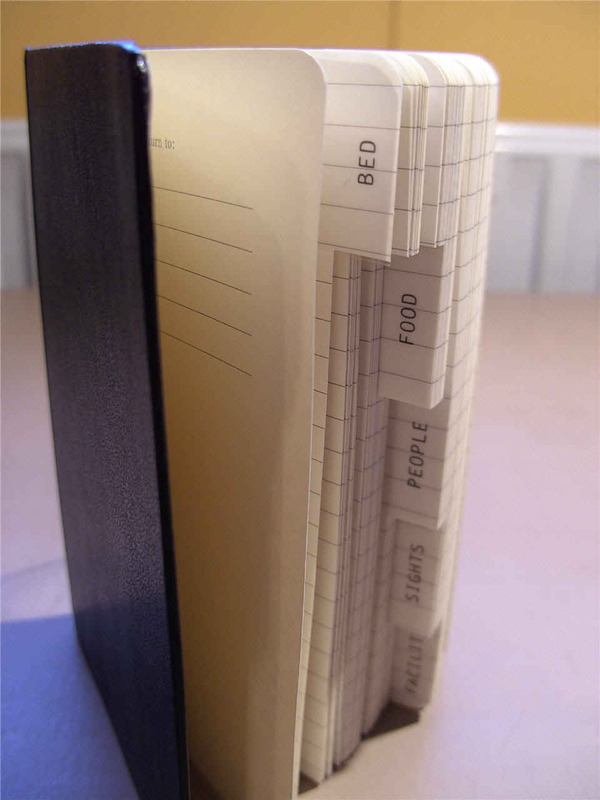 I did see the Moleskine infobook a couple of times in the store, but dismissed it because I don’t see myself keeping track of “bed”, “facilities” et cetera while traveling. Playing around with my other Moleskines and reading about other GTD hacks gave me the idea of hacking the infobook! this looks sooo good! i just picked up a few pens to test drive (my space pen blotches, so i am trying the G-2, Dr. Grip, and UniBall Signo 207), and two moleskine infobooks arrived by post. tomorrow, i put the label printer to work! thanks for what looks like a fantastic hack. Enjoy your GTD infobook! Let us know how you like it! got here via a digg and a few clicks. im just wrapping up reading GTD for the first time. before i actually implemented anything, i wanted to read through the whole book and see the whole picture first. one concern i had was the whole analog/paper thing. it seems that this whole system is very much low-tech. i know david unapologetically describes it as the most efficient way, but i would much prefer to have everything electronic and available. i can imagine losing my 2007 book sometime in september. i currently am a heavy treo user, along with gmail (docs&spreadsheets) etc. anyone have a solid hightech solution? May I suggest starting at the GTD Index? 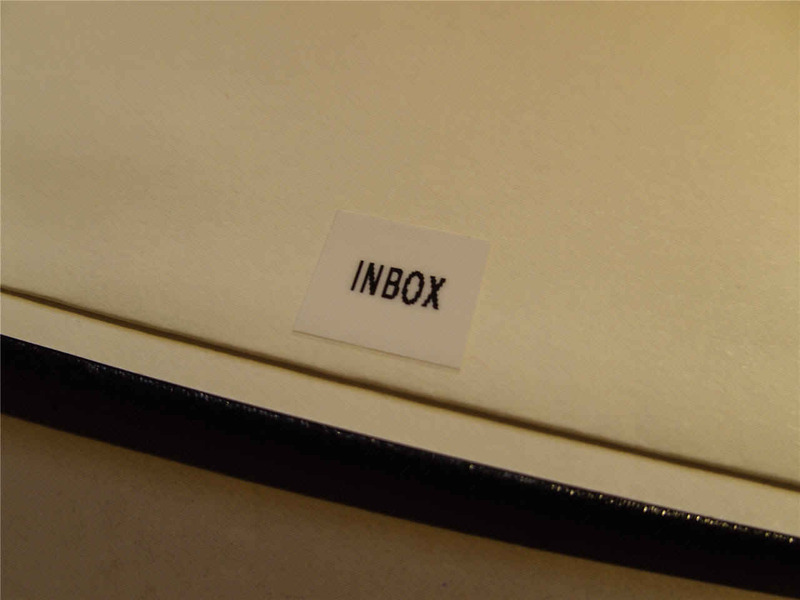 It contains a lot of links to interesting GTD blog posts and many links to (online and offline) software you could use to implement a more high-tech approach to GTD! Good luck and let me know if you succeed! I have a question: It is unclear from the pictures. Is each page’s tab labeled with “Bed” (or whatever section you are in) or is only the first page in the section labeled? That is, are the tabs for the first 30 pages labeled ‘Bed’ over and over, or is only the exposed page labeled bed and the rest are blank? Very good question. In the original Infobook as well as in my GTD hacked version only the tab of the very first page of the section is labeled. OK, so I’ve done this hack to my moleskine, but I’m wondering how you deal with contexts…I am just using a page inside my actions section per context at the moment. Any other ideas? Well, I’m not actually using this Moleskine infobook at the moment (anymore) to Get Things Done… but, if I would, I would reserve several pages in the Next Action section of the infobook for each context. I definitely wouldn’t add labels on the page because that would defeat the purpose of using the infobook with the neat sections in the first place! One other possibility: use 2 infobooks! One for your project list, someday/maybe list and so on. The other exclusively for your Next Actions so you can use the sections as separate contexts (if you don’t need or use more than 6 contexts, that is). nice hack. with your idea, I decided to modify some of the plain pocket moleskines I had stockpiled. Knowing that my next actions take more pages, I allocated more pages to that section, more to reference, less to projects, etc. then, with the help of a razor blade and some cardboard backing, i began to slice the appropriate partitions in my plain notebook and voila! custom GTD/info book. 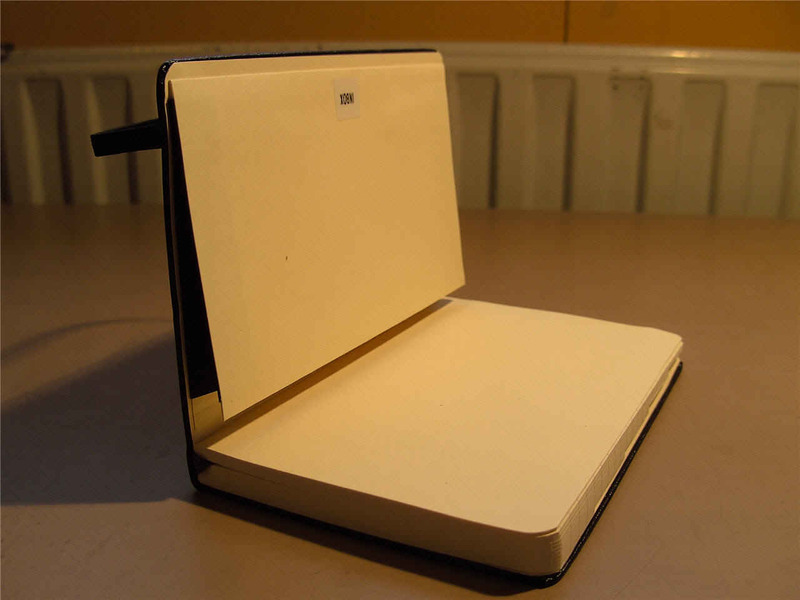 Good idea, I saw that kind of Moleskine hack before. Perhaps you could share a picture of your modified Moleskines? Yeah, good idea. It would be nice to have an idea of your layout within and on the pages of the GTD hack? Excellent job. I did it the moleskine tab hack the hard way, I cut my own pages. Lots of work but then, at least you can create the number of pages you want in each tab. The Projects section is merely a list of project names, or placeholders. GTD projects consist of 2 or more actions, which are listed in the Next Actions or Waiting For section. I really like your hack although I think the inbox would get a bit small for me… Also, items on my lists get lost when I give them large sections like that. Check out this variant as well that includes a calendar. Just wanted to let you know that there is a site that scans/digitizes Moleskine notebooks for you. The address is http://www.scan4me.com.